Mark Rashid has put the interests of horses and people first in his journey of discovery, unveiling truths which help humans to form a trusting relationship with horses. It is true that different religions have different names and ways of describing God, but when they are looked at more closely, the message is always the same. There are absolute truths which unite our world, often in ways that many of us are unaware of, but when we make it our mission in life to look for them, they will appear. They may appear in different forms, and of course we will refer to them in different ways, but the essence is the same. 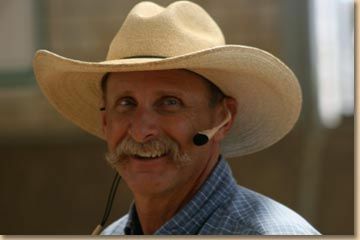 We have come across, whether personally or through books and videos, many kindred spirits in our search to understand the truths of all aspects of horsemanship. Our only value has been to do the best we can for the horses, and therefore people. In this way we have come across exceptional saddles and hoof boots. 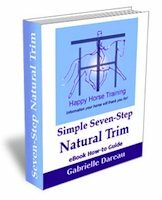 We have learned from the outstanding teachings of Charles de Kunffy on the complex subject of horse and rider biomechanics in dressage training, and we were highly fortunate to be able to learn truly cutting-edge natural hoof trimming techniques from Tara Calvert-Jackson. We have also learned from Monty Roberts, and in terms of Natural Horsemanship, we believe that there is no better advice to be found than that of Mark Rashid. Simply because, like all those above and many others unmentioned, understanding and working with horses is for him an opportunity to reach deeper inside ourselves and find our inner truths. 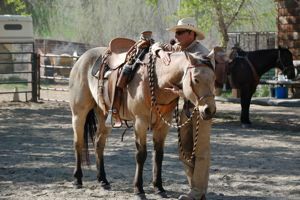 Mark Rashid has, in the tradition of natural horsemanship trainers, studied the herd dynamics of horses amongst themselves, and he has come to some highly perceptive conclusions. In particular that the 'leader' which was often believed to be the 'alpha' horse (in a wild herd this would be the stallion) is in fact far more commonly what he has termed the 'passive leader' (in a wild herd situation this would be an older mare). The passive leader has a different temperament and a different capacity than the alpha horse, if it were to be summed up in a few words, the passive leader is reliable and consistent. The passive leader knows where water and shelter can be found and will always make the best choice possible for the welfare of the whole band. In studying the passive leader and their role in the herd, Mark Rashid has concluded that if people wish to form a trusting and altruistic relationship with their horses, it is this herd figure they must learn to emulate, simply because this is the figure who engenders the most trust from the other herd members. We would recommend Mark Rashid's books to anyone, involved in any discipline, if they are interested in improving their awareness of their horse's behavior, and their own behavior! After all, it must be admitted that horses don't have anything to learn about being horses. Even when we do our best to alter them, they have a fabulous capacity to redeem their fundamental horseyness. 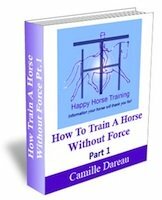 It is primarily people who must train themselves in many ways to become accomplished horse-people, and in doing this we will also become accomplished people, because horses help us to discover our own inherent wisdom. Mark Rashid's books also describe his own spiritual evolution as he becomes aware of the parallels between the Martial Art Aikido and horsemanship, and how it is possible to apply the same values in our day to day rapport with our horse, and with other people. Ideas such as our level of energy, and how we can balance ourselves with our horse, were in delightful accord with our own understanding of what we refer to as our 'vibration'. Not only this, but we recognized in Mark Rashid's teachings the same awareness of the subject of the traumatization of horses, its significance and how it can be resolved. Seeing the same conclusions coming to the surface, after many years of a different kind of experience of working with horses, is highly inspirational, because it tells us that these universal truths really are within all of us. 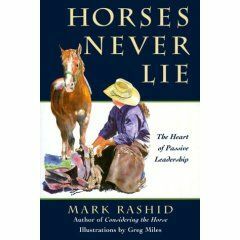 When we first heard about Mark Rashid's passive leader philosophy, it was interesting to study our own horses, and see how they arranged themselves in those terms. We had always noticed that the most dominant gelding, in fact the 'alpha' male, was never the one who led the herd. He's a bit of a silly warmblood, and although very bossy about his share of the food, he would always push another horse in front of him to go somewhere 'scary'. 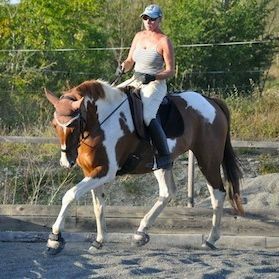 We concluded that we have two passive leaders: a 15 year old Hannoverian gelding called Tali, and Xas, a ten year old mare who we bred ourselves. 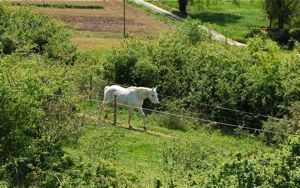 Tali (making his way round the lanes in this photo) has had a tough life, and although in his relationships with people he was very diffident for a long time, he has always been a very caring horse, and particularly concerned about the herd as a whole. If a member of the herd is removed for any reason he is there, keeping an eye on the proceedings (see The Significance of the Horse Herd for the story of such an incident). His position in the hierarchy is quite high up, but he rarely pushes in to get his share. He is a true gentleman, and he has had various very close relationships with mares. When these relationships had run their course, it was always the mare who moved on, and poor Tali who was left behind! 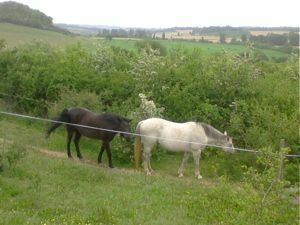 Our other passive leader, Xas (the grey mare in this photo), was born with Neo-natal Maladjustment Syndrome, which happens as a result of an oxygen imbalance in the brain. In fact she became very close to humans because of this, although she did have a normal infancy with her mother since she successfully regained the suckling reflex. She is very much a thinker, and also a particularly altruistic mare, often leading others out of difficulty and doing the sensible thing in a crisis. She likes to demand that the other horses are patient at feed times, and holds them down the lane until they are willing to walk calmly. Both of these horses have an egalitarian and benevolent mind-set. They care about others as much as themselves, as well as knowing how to look after themselves. This is perhaps the greatest lesson they have to teach us, and why they have become the horses that everyone trusts and follows. We are also in agreement with Mark Rashid's opinion that the altruistic connection that it is possible to achieve in riding cannot be equaled. In our opinion the approach of the passive leader also applies directly to the physical dimension of riding, through the use of the posture. 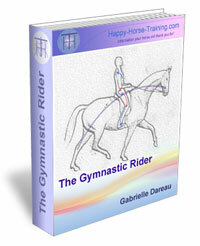 Looking at it like this, we can understand how the intelligent approach to dressage is not one of dominant, forceful riding (trying to assume the 'alpha' role) but instead it is in training our own body to be capable of gymnastically channeling the horse, to lead him into balance, power and grace.